Snuggled up this morning in the warmth of my home I am reminded of a winter only a couple of years ago where snuggling up took on a whole new meaning. a bitter cold that was just miserable. Our thermostat proclaimed a believable 46 degrees inside. The kids were 6, 5, 3, and 14 months at the time, keeping them huddled under blankets was a challenge. I'm going to say it... "Praise God for Television!" It worked to hold the kid's attention for a few long hours that frosty morning. 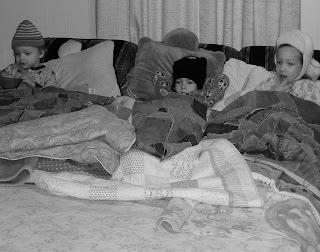 Blankets, hats, and more blankets helped to at least keep them from catching pneumonia. Mommy's attitude seemed to be what suffered the most. I despise being cold, it's miserable! I don't like my babies being cold either. I had endured four very cold winters in this old house all without much complaint. I had tried to use space heaters frugally. When I dressed the kids in multiple layers in the mornings (just to spend the day indoors) I would remind them of how much God had blessed us with plenty of warm clothes. So how was God repaying me? With a 46 degree house and no way to warm it up. Grrrr and Brrrr!!!!!! I had had plans to meet a friend for lunch that afternoon. The idea of sitting in a nice warm restaurant sounded wonderful but I felt a little guilty leaving the rest of the family to tough it out. I dressed and then put on my warmest coat, hat, gloves and scarf. I ducked my head and stepped bravely outside to hustle to the car. "What in the world?" It wasn't near as cold out as I was expecting. In the car I had to take off layers just to be comfortable. According to the weather man it was actually 20 degrees warmer outside than it was in my home. You know, the house that never holds an ounce of cool during he summer? Yep, that same house had managed to trap in all of the nights cold and then hold it ransom for our "enjoyment". It had deceived us into thinking there was no relief from the chill and we had bought it! Before I could pull to the end of the street I had dialed the house number and told Jarrod, "Open the doors and windows, it feels fabulous out here!" I had been determined to grumble that morning. I had assumed the worst. God didn't rouse himself that day to notice our chattering teeth and goose bumps. He didn't care! All around town heaters, glorious heaters clicked on and off to keep our friends and neighbors comfortable. Fireplaces blazed beautiful shades of orange and red. All the while we huddled and rubbed our hands together. Little did I know God had a fire blazing right outside my front door, it had been stoked and tended to before my toes had even left the warmth of the covers that morning. I was so busy comforting myself with excuses that justified my icy attitude that I had not looked for God's provision. I had asked for a bit of warmth and then concluded he had not heard and my answer would not come. Have you ever held out a cup of milk to a child who was so busy stomping their feet for a drink that they had not taken the time to look up into your outstretched hand? I was that child. My father had sent in a sunlight to warm my entire day but my own misery kept me indoors and fridgid. If you have asked God to intervene in your life, take a moment to look up into his outstretched hand. See what he holds out for you. It may be a simple matter of reaching out and taking hold of his provision. Your "drink" may not be in the cup you were expecting. The warmth you desire may not come in the form of a fire place - but he is always listening. I have always loved my husband's attitude about long hard hours he has had to work. When I tell him, "I don't understand, I have asked God to provide for our needs!" He tells me simply, "He has, in the form of a job where I can go work more hours." Is God trying to provide for you today but you can't see past your misery? Instead of staying indoors and trying to warm yourself with complaints, open up the doors and let His sunshine in. P.S. I LOVE comments! I'd love to hear from you! Blogiversary And My First Ever Giveaway!!! A Pity Party and A Link Up Pary!